This being the first weekend of the month, it was my latest opportunity to use the "buy some food, get $10 free play" coupons from the Wigwam. You have to sign the coupon before you use it, and so I dug a pen out of my tote bag. I note that this pen came from the Holiday Inn Helsinki from during Worldcon 76. It has been with me ever since. It was a good day. 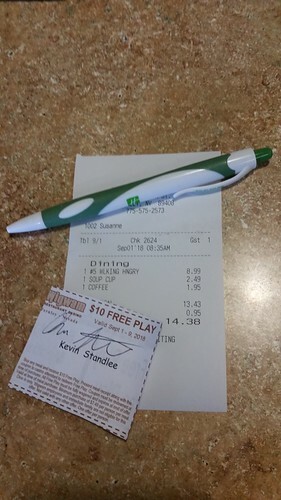 In conjunction with a "Win $10, get $10 free play" coupon, I walked away with $32 with nothing more invested than the original $17 (including tip) from my breakfast. Today I continue the process of cleaning up web sites I administer and doing work on various WSFS/Worldcon material. Lisa is working on home improvement projects, about which I'll have more to say when they have matured.